This entertaining history of floral decoration gives us a glimpse into the origins of utilizing flowers as decoration, from ancient traditions to folk customs and over-the-top fads. Let's take a look at some interesting and curious tidbits from historic records, archives and chronicles of the 16th through 19th centuries. Before the 16th century (1501-1600), there is almost no information to be found that flowers were used for decorative purpose. There is abundant proof that flowers were employed in medicine, surgery, and cooking, but only the works of early poets and ancient accounts provide perhaps the only evidence that flowers, for their beauty and scent, were used at all. As you may have guessed, the use of flowers for decoration appears to have started with religious gatherings. From ancient accounts, we have learned that priests wore garlands of roses at summer festivals. Torches carried in religious processions were decorated with flowers; the streets of the path of a religious procession were strewn with flowers. When we come to the 16th century (1501-1600), the expanded records and literature preserved from those times present an extensive history of floral customs. Church decorations and the use of flowers on ceremonial occasions were of a particularly lavish nature during the reigns of Henry VII (1485-1509) and Henry VIII (1509-1547). According to the time of year, churches were adorned with roses, lavender, holly, ivy, birch, and palm. Historic church accounts note in detail the sums of money spent on such flowers and evergreens, and taking into consideration the relative prices of the times, those sums indicate the purchase of much material. With regard to the history of floral domestic customs, it is recorded that Henry VIII substituted sweet smelling herbs and flowers for the hay and rushes that were routinely used for strewing the floors of living quarters. Daughter of Henry VIII, Queen Elizabeth was so fond of flowers that she appointed a strewing-maid, whose sole duty was to renew the herbs and flowers in the royal apartments and council chambers. After the short reigns of her brother and sister, Elizabeth reigned as Queen of England and Queen of Ireland from 1558 until her death in 1603. And, many of us are familiar with the tradition attributed to May-Day, when all kinds of flowering vegetation was used for decorations. May-poles were twined and bedecked with vines and flowers, and children of the community were gaily adorned with flowers. People also decorated their houses with flowers and boughs. Holly and ivy were very popular. Branches of birch mixed with fennel were used as decoration inside and out. Fireplaces were embellished with flowers, branches and potted florals during the summer months when the fireplace was not in use. To dress up a fireplace, the back and sides were lined with moss and shells glued to strings. Loose branches were arranged on the hearth, with sweet briar and flowers that were changed weekly. For variation, bundles of reed-grass and roses in bunches were also used. Another custom was that of decorating beds with flowers. This probably originated from a desire to retire on something choicer than stiff, dry straw covered with a sheet. Women began setting about their beds small bunches of flowers tied together in tufts. Bridal beds were invariably decorated with flowers. The violet, lily, daffodil, and rosemary were favorites. For resting after child birth, mothers enjoyed recuperating amidst the scents of rosemary, carnation and sweet william. Newborn babes lay in cradles bedded with lilies, roses and violets. Customs on the occasion of a death also involved a lavish use of flowers. Rosemary was a usual herb to carry in the hand at funerals. Other flowers were used as well, and these were either thrown into the grave, or strewn on the covering ground. In those days, coffins were a luxury of the wealthy, so most people went without one. For the common folk, a burial winding-sheet was used to wrap the body, and an abundance of flowers were stuck upon the sheet. The history of floral wedding rituals has similarities to modern customs. On the occasion of a wedding, large quantities of flowers were used to decorate the house, and to strew the street to the church and also the church aisles. Of course, the bride herself would be decked with blossoms. She would wear a crown of lilies, roses and daffodils. She was led to the church between two young boys, with rosemary tied about her silken sleeves. Each boy beside her would also carry a branch of rosemary. Attending lads and lasses also carried rosemary or, if the time of year was suitable, nosegays (small bouquets) composed of ladysmock, pansy and rose. It has been recorded that the courtiers of King James I (reigned 1603-1625) wore flowers in the ear, and persons so adorned attended James on his hunting expeditions. During the reign of King James' second son Charles I (1625-1649), women sometimes wore flowers or fruit on the arm, which was bare to the elbow. There was also an old English custom of both men and women wearing garlands, generally in the form of a crown worn on the head. Sweet flowers, roses, primroses, cowslips, daffodils, and many others were used singly or mixed together to create these garlands (also known as chaplets). 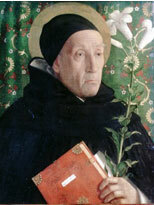 In old portraits, garlands of flowers are depicted intertwined among the hair, but also worn in small circular wreaths on either side of the head. In the early 1800s, it was customary that on Sundays and holidays every village beau and straggling townsman who could come by a flower would wear it in his button-hole, and women would place flowers in their hair. Before the 17th century (1601-1700), there are no early references of placing flowers or arrangements on dinner tables. This is mainly due to the fact that a large number of prepared meat dishes always loaded the tables, leaving no space to waste on floral adornment. People wanted to eat, never mind the decorations! However, there is record of a stylized, edible SALAD of flowers on a dish, using purslane for the stalks, sliced cucumber for leaves, and preserved petals of violets, primroses, and carnations for the blooms. Paintings and woodcuts from the 17th century show that vases of flowers and foliage were in use. Flowers were tied together in bunches and placed into the vase. Myrtle was often used as an aromatic green foliage filler. One of the earliest known written studies on using cut flowers as decoration was included in a Latin book on flowers: Flora, sue de Florum Cultura, Rome, 1633. 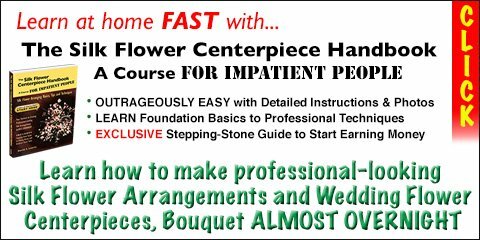 One chapter is devoted to bouquet-making and cut flowers, and from it we gather that the construction of floral bouquets was a recreation of the nobility. 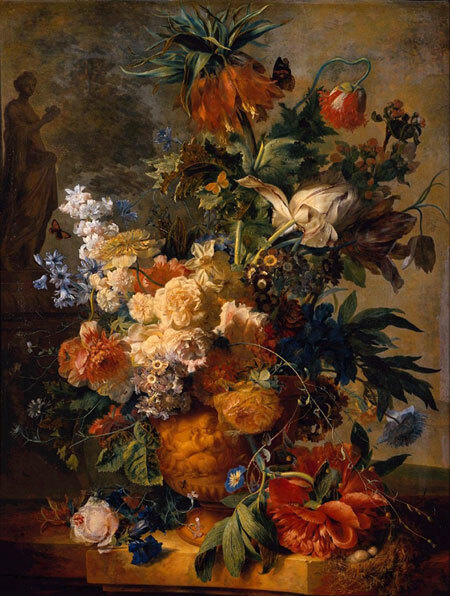 During the 18th century (1701-1800), the art of floral composition progressed to a high state of perfection, as seen in this circa 1730 still life painting of a flower arrangement by an artist named Jan Van Huysum from Amsterdam, Netherlands. It is said that Van Huysum had not one imitator that could equal his magnificent floral works. Note the artful combinations of colors, shapes and sizes. The main flowers in this painting are Cabbage Rose, Anemone, Poppy, Iris, Auricula, Convulvus, Cornflower, and Aster. During the early decades of the 19th century (1801-1900), flowers and evergreens were profusely used to decorate halls. Flower shows became popular, and besides wall decorations, there were huge bouquet displays. Some of these reached 10 feet in height, and were sometimes in the form of pillars. In the second half of the 19th century, single floral centerpieces were being placed on the table. In later years, a number of glass vases with cut flowers would be set about, or a single glass trough would present a larger display. 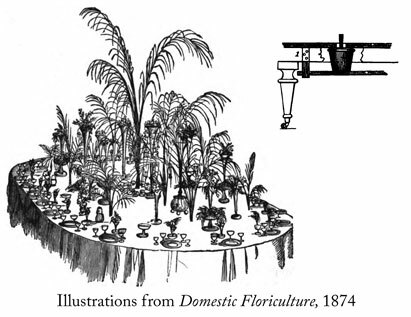 By 1870, it was ultra-fashionable for dinner tables to look like jungles of tropical vegetation. Palms, ferns, flowers and grasses seemed to spring up from the midst of some greenery on the tablecloth. How was this done? For large plants, tabletops actually had holes cut in them, with the pots supported by a strong platform hidden underneath! So, when did artificial flowers first make their appearance as decorative accents? Records indicate that the history of floral fakes began towards the end of the seventeenth century (1601-1700), when a new practice arose. Flowers made of paper, silk and other material began to be substituted for natural flowers. These hand-made fake flowers came to be known as French flowers or Gum flowers. A writer on the subject at the time actually commended these artificial flowers as being more sophisticated, and the effects prettier, than using real flowers. On the other hand, another writer remarked on the dinner table being decorated with painted leaves and paper flowers in a foolish mimicry of natural art. In a later commentary, in a description of a Lord Mayor's dinner, the chronicler laments bygone days when the guests could scarcely see their opposite neighbors across a table loaded with plates heaped with sweetmeats and delectables - but no more. Alas, those overflowing food plates disappeared to make way for a single, albeit bounteous, community plate that was surrounded with a multitude of artificial flower decorations! I hope you enjoyed this compiled history of floral decoration. Who knows, maybe we will see some future floral trend or fad reappearing from days of old. Copyright © 2003-2019 Silk-Flower-Smart.com. All rights reserved.